A short post today, in our earlier roundup of rumours one we didn't cover is the 'Trevi Fountain' set. 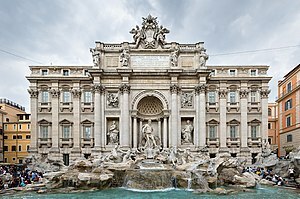 As you can probably guess, this will be an architecture set of the famous Italian fountain in Rome (shown below). It will certainly be an interesting one to see how they design it, especially with the water. Although it is unlikely to be 50 metres wide like the real version, I hope they do it justice with a substantial part count.